Why do all societies acknowledge that their poorest members are deserving of the support of those who are better off? A new study carried out by psychologists at LMU throws new light on the social and cognitive roots of charity. Illustration „A Christmas Carol“ from Charles Dickens. In Charles Dickens‘ famous story “A Christmas Carol”, the rich but hard-hearted Ebenezer Scrooge shows himself to be impervious to the claims of Christmas charity, and refuses to give alms to the poor. It takes the intervention of the Spirits of Christmas Past, Present and Future, who haunt his nights, to turn him into a generous human being. 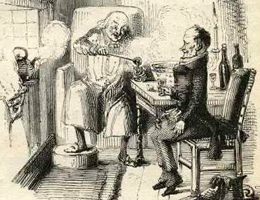 Dickens thus resorts to drastic measures to teach Scrooge what young children already possess, a willingness to share with the needy, in other words – charity. A new study carried out under the direction of Markus Paulus, Professor of Developmental Psychology at LMU, now shows that 5-year-olds already display charitable behavior. The work makes a significant contribution to the ongoing debate as to whether the impulse to be charitable is rooted in early stages of child development or is the product of a much longer process of socialization and education. As Paulus reports in the latest edition of the journal “Frontiers in Psychology”, his experiments show that charity originates during early childhood. The paper describes experiments in which 3- and 5-year-old children were given a set of stickers which they could share with two teddy-bears. The wealthy teddy-bear’s album was already well filled with stickers, while the poor teddy-bear only had a few. In different experiments, the children were given different instructions as to how they could share the stickers. For instance, they could decide whether to give one sticker to either of the bears and three to the other, or to give two of their stickers to each. In all experiments, the 5-year-olds always gave the majority of their stickers to the poor teddy-bear. The 3-year-olds, on the other hand, generally made no distinction between the two, and showed little tendency to favor the poorer recipient. Indeed, this group was actually inclined to be more generous to the wealthy teddy-bear.